The Three Stooges have a rather complicated history, yet we all know the names Larry, Curly, Moe and Shemp. The original stooges were Moe Howard, Shemp Howard and Larry Fine. The trio stemmed from a 1925 vaudeville act, and their first film was 1930’s Soup to Nuts. Shemp’s initial stooge membership, however, was short-lived. Fed up over managerial practices, Shemp left the trio just two years later, and brother Jerry Howard joined in as “Curly”. Brother Shemp returned to film many new projects, while Curly recouperated out of the limelight. It was 1934 when they were officially “christened” The Three Stooges, and they went on to become – unbeknowest to them – one of the most popular box office draws. Curly, of course, was the favorite of many fans, so when news spread that on May 6, 1946, during the filming of Half-Wits Holiday, the young stooge suffered a career-ending stroke, fans, as well as management, were concerned. It was 1947’s Hold That Lion! that produced a most memorable Stooges moment. Curly had made an impromptu visit to the soundstage and director Jules White spontaneously staged a bit showcasing all four original stooges. 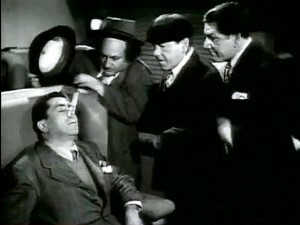 The clip also marks the only published scene containing all three Howard brothers. Take a look at the remarkable moment as captured from the film. It is Curly’s last big-screen appearance. He died January 18, 1952. What are some of your favorite Three Stooges moments?